After the article “Paint the Flowers on the Wall” we have had some interest in the pattern to make one of these flower coat hooks. 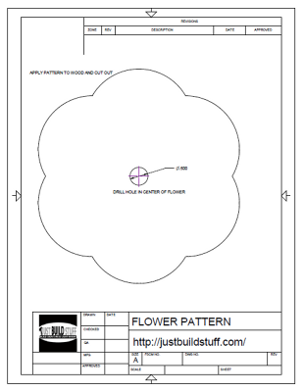 I made a pattern and some instructions to cut out one of these flower hooks yourself you can download a pdf of the plans by clicking here or on the image below. 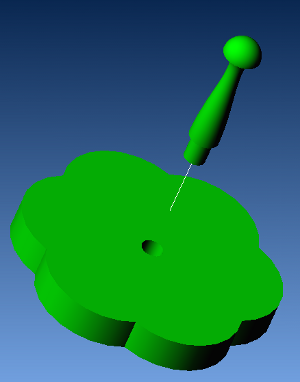 3 1/2 inch shaker peg as seen in the photo below. Add some hanging hooks to the back and you will have nice flower coat hook. Everybody knows that the stockings were hung by the chimney with care, but what if you don’t have a chimney? No chimney, no problem! A beautiful way to display your family’s stockings is with a “The stockings were hung…” wall plaque and justbuildstuff.com is going to tell you how to make one. To start, cut a piece of scrap softwood lumber (pine or fir – most construction lumber is softwood) to 29″ by 5 1/2″ by 3/4″, router the edges with an Roman Ogee router bit and spray paint it red. To give it a more aged look, rub the edges with some used 120-grit sandpaper saved from previous projects. Also lightly rub the face of the board to take away some of the shine and make it match the edges. See the photos below to see how the board looks at this point. To create the letters we found a font we liked and printed the phrase in the appropriate size. Keeping in mind where the hooks would eventually be placed, we taped the phrase to the board as shown in the photo below. With the lettering taped to the board, we traced an outline into the board using a dull pencil. Because we used softwood lumber for the project, it indented easily to make an impression of the letters into the board. Then, with a thin paintbrush and the white paint, we painted the phrase in using the indented letters as a guide. After the paint dried, it was time to add the hooks for the stockings. We used single hooks screwed in at even spacing. The final step was to add a hanging bracket to the back, place it on the wall and hang the stockings. Now the only thing left is to wait for Santa to come and fill the stockings with Christmas goodies! 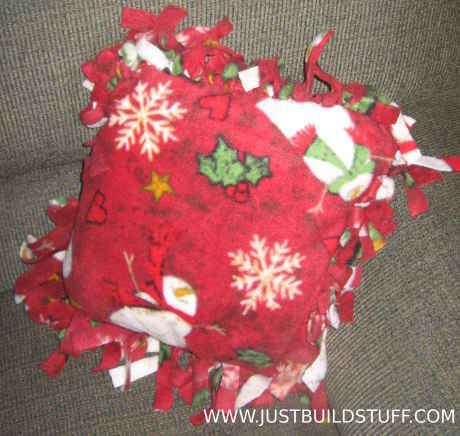 Simple Snowman Fleece Tie Pillow! 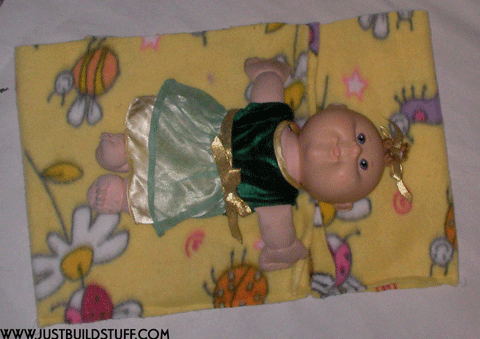 Looking for a holiday craft to do with your kids? 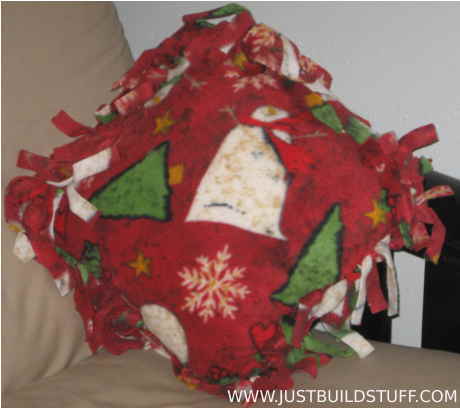 This easy to make snowman pillow is a fun project that doubles as a festive holiday decoration. Plus it will be a great place to rest your head if you start to experience holiday fatigue. 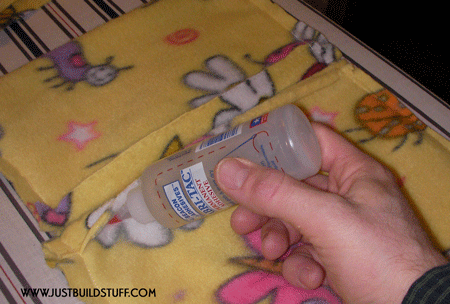 Many of our readers likely have seen or made a fleece blanket with the frayed ends tied together. 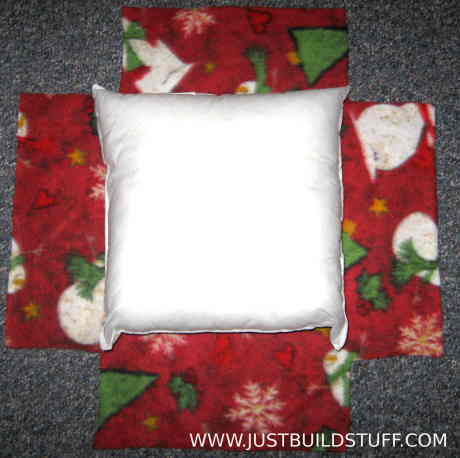 In this project, justbuildstuff.com is going to use a similar process to make a pillow from fleece with a snowman print. 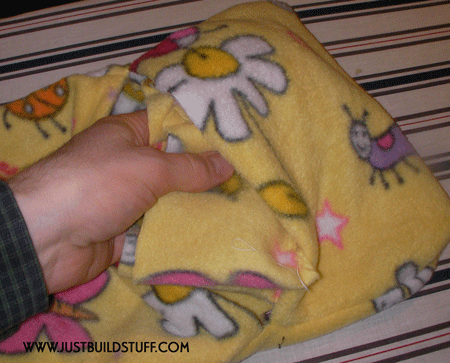 To begin, we took the 2/3 yard piece of fleece (it should measure 24″ by 36″) and cut it into two 24″ squares. 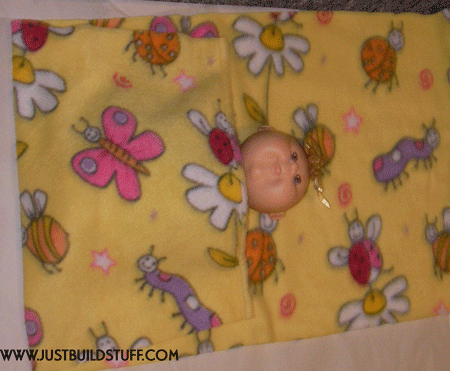 These two pieces of fleece will be used to cover a 14” square pillow purchased from a local fabric store. After the two 24” squares of fleece were cut, we snipped a five” square from each of the four corners of the fabric so that the center measured a 14” square (the same as the pillow). This is shown in the photo below. Then we cut each side into 3/4 ” wide strips as shown in the photo below. When the edges were cut, we faced the best side of each piece of fleece outward, placed them on top of each other, and begin tying the 3/4″ strips together with square knots. 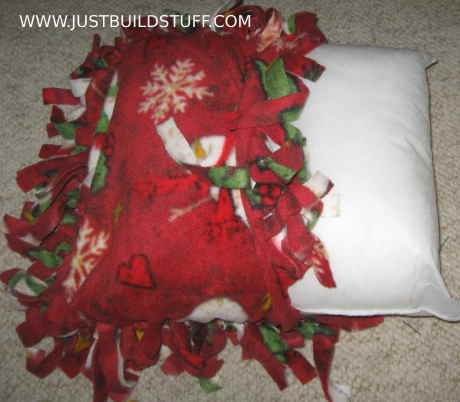 When three sides were tied, it was time to stuff in the pillow as shown below. 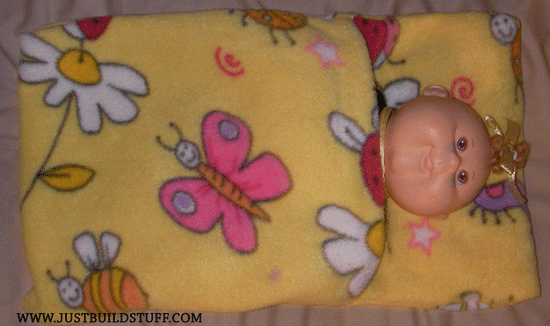 After the pillow was inserted, we tied the final side. It was simple, fun, and it looks great. 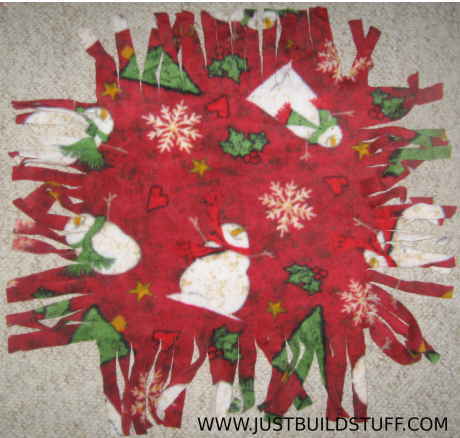 The next few posts on justbuildstuff.com are going to be about building the turkey shown in the picture below from some simple materials found at any craft store. To get started making the turkey you need the following tools. And the following craft supplies. To get started we cut the tail out of felt. First cut a brown piece as large as the entire tail and then individual feathers of the other colors. You can use the picture below as a pattern for cutting the tail and feathers, it may need to be scaled in order to be sized correctly, our tail is approximately 4.5 inches wide at the widest point. The first thing we cut out was the base for the tail. 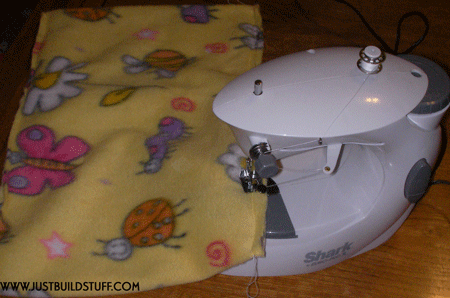 As shown in the picture below, we just laid the pattern over the felt sheet and cut around it. Do not worry about the precision of your cuts, you can clean the pieces up after you make the initial cut. Next cut out the feathers, from multiple colors of felt. Test lay the feathers on the tail base, and when you are satisfied with the pattern of the tail feathers glue them onto the base with a hot glue gun. Cut the large part of the wing from the dark brown felt and the wing tip from a light brown felt, attach the wing tip with a drop of hot glue. The feet can be cut out next. Aafter all the felt pieces are cut out they can be glued to the 3 inch clay pot as shown in the picture below. This is the part of the project where we will create our turkey’s head. If you missed the Introduction or Part One- Cutting the Felt go back and check them out. The first thing to add to the head is the beak cut from orange felt and hot glued in the center of the 2″ Diameter Wooden Ball , after the beak is added and the glue is cool add a drop of glue to the top of the beak and attach the turkey’s wattle over the top of the beak. Next either draw on eyes with a black permanent marker or add Glue On Eyes and place them where they look appropriate above the beak. Check your progress with the photo below. The only tasks remaining to finish this project are to glue on the head and add the turkey’s Pilgrim Hat. Gluing on the head is simple, we just used hot glue and offset it towards the front of the pot as shown in the photo below. The final part of the project is to make the turkey’s hat. The hat is made by taking the cardboard roll from a used up roll of toilet paper. Cut the cardboard to approximately 2 inches in length an wrap black felt around it. No cut a felt circle the same diameter as the cardboard roll with some tabs overhanging the outside of the circle. Glue this to the top of the hat by placing a drop of hot glue on each of the tabs and placing them inside the cardboard tube. Accent the the hat with a white felt stripe and a gold felt buckle and the turkey if finished and ready for a thanksgiving feast.